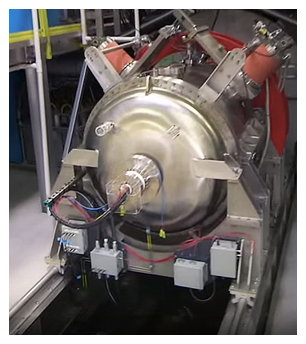 Linear Motion Control Application – How Would You Position Components Of An Experimental Reactor Vessel Weighing 33 Tons? Easy … Using Custom made LM76 Jet Rail Bearings and Shafting! E. Longmeadow, MA –Linear Motion Control Application – When a privately funded research company was ready to move from their original Proof of Concept to a sustainable fusion reactor to produce clean sustainable energy, they realized that extremely heavy components would need to be assembled and disassembled and reassembled again for design modifications and maintenance. The completed assembly would be the length of two buses and easy alignment of the individual components would be critical. See photo to right – On each end of the assembly is a Plasma Gun. The Plasma Guns as are all the floor lever components, are positioned using LM76 Jet Rail Bearings and shafting. The Jet Rail Bearings and Shafting can be seen near to bottom of the picture. In addition to the reactor, high energy particle beam generators are positioned at angles to the fusion containment chamber. These particle bean generators form and suspend the plasma medium for an indefinite period of time in the center of the containment chamber. These generators have to be easily positioned – by hand – to accommodate adjustments and re-assembly. See photo to the left – Neutral-Beam Injectors are positioned around the Reaction Chamber to position and shape the Plasma Medium. These are also moved into position on LM76 Jet Rail Bearings and Shafting. In addition to supporting the weight of the components, the bearings selected to move these massive loads during the construction and testing of the fusion reactor would have to be non-magnetic. Working with engineers, LM76 developed a custom 3 inch Jet Rail Bearing designed to carry both the weight of the fusion reactor and the high energy particle generators. In addition LM76 supplied precision ground, 3 inch 303 stainless steel (non-magnetic) shafting. 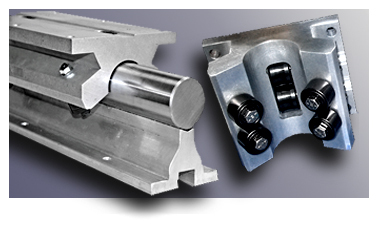 The custom manufactured Jet Rail Roller Blocks and 303 stainless steel shafting simplified the assembly/disassembly of the fusion containment chamber and components while ensuring critical alignment throughout travel. 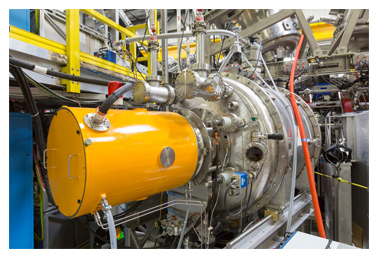 This breakthrough fusion reactor is still in the experimental stage. A commercially viable reactor would need to contain 100 million degrees. Why is the project so important? Because in addition to producing sustainable energy, its only by-product is, environmentally safe, “helium ash.”. See photo below – The drawing below shows all the components in place. The assembly is 60 meters long and supported on LM76 jet Rail Bearings and Shafting. « Motion Control – IP69K Food Grade HMI Solution from Exor Available from Electromate!